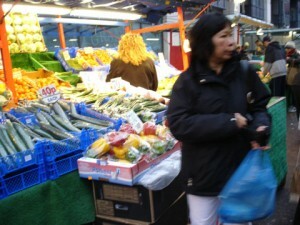 An arrangement of sounds from Croydon’s wonderful fruit and veg market. There has been a market in Surrey Street since the 13th century. 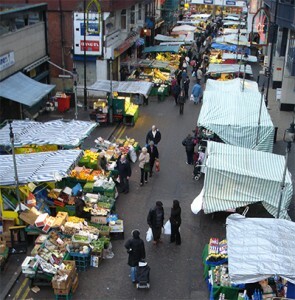 I first discovered Surrey Street Market when I was taken there by Mary Webb and Jenny Gunston from Croydon Clocktower Museum. We were investigating the sounds of Croydon as part of a community arts project. I was so struck by the cries of the market sellers, I decided to make a return visit and collect some sounds for my own archive. In Christmas 2006, I put these sounds together to make a short soundpiece, celebrating the sounds of that market. I visited the market with my good friend Rachel Attmere and the stall holders were very friendly, once they realised I was holding a microphone and not a bugging device from the council! When the trader calls ‘Two scrubbers for a pound’, he was looking at us and smiling. We’re very fortunate in Britain to be able to find such a wealth of beautiful sounds on our doorstep – sounds that are deeply rooted in the history of this island and the various cultures who settled here over centuries.